During the IFRS adoption, a company will make some simple and straightforward changes, such as adding a few extra accounts in its corporate financial systems so it can collect existing data in a different way. Other changes will be more challenging, requiring the company to change several business processes or, in some cases, redesign all or part of its financial system. As companies may not know exactly what changes are needed until they get started, a period of volatility is inevitable. Even changes that appear easy and straightforward can produce major impacts on financial systems and processes. As companies have overcome the initial volatility and completed their first IFRS financial statements, the initial disruption is likely to subside. 1. Analyse IFRS requirements to thoroughly understand those that apply to the company and, to the extent possible, how they apply. 2. Analyse current business processes and systems to identify the gaps in current operations. 3. Use this information to establish a realistic budget. 4. 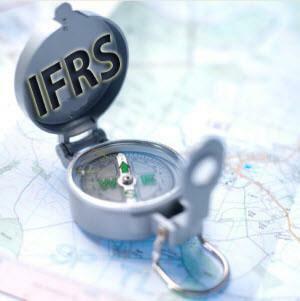 Establish a multidisciplinary team of employees to lead the IFRS transition. 5. Establish a clear road map of the steps the company will take. 6. Communicate the road map to key executive decision-makers and, as appropriate, to broader groups of employees. 7. Communicate the progress to executives and employees and, when it makes sense, to key external audiences such as investors, outside directors, partners, vendors, and key industry influencers.